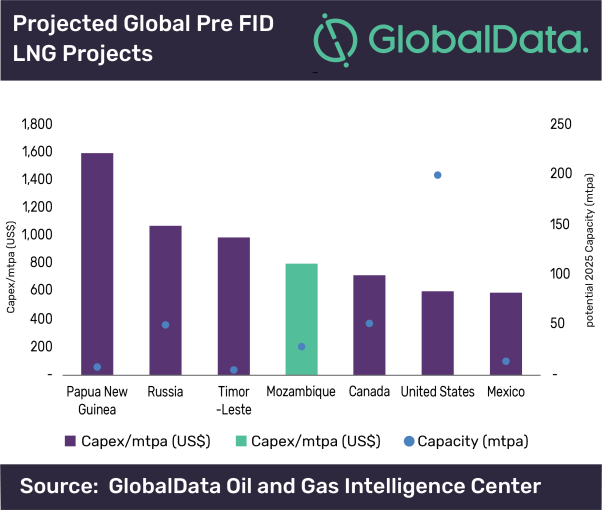 Mozambique is expected to become one of the world’s top 10 largest LNG producers by the mid-2020s, when over 30 million tonnes per annum (mtpa) of LNG comes on stream, on a par with capacity in African leaders Nigeria and Algeria, says GlobalData, a leading data and analytics company. The feed gas for new LNG projects will come from the ultra-deepwater Rovuma Basin, where over 125 trillion cubic feet (tcf) of recoverable natural gas resources have been discovered to date. This consists of 75 tcf in block Area 1 and 50 tcf in block Area 4. Participants in Area 1 and 4 are now progressing towards final investment decisions (FID) for the onshore LNG terminals. Both external and internal Mozambique-specific challenges have slowed progression of LNG developments in the country. However, positive signs such as securing additional gas sales and purchase agreements have formed the majority of the activity from Mozambique and Rovuma LNG participants so far in 2019. These contracts are a key part of the projects progression towards the construction phase, as they provide some certainty about future revenues to underpin the massive capex of nearly US$40bn required to bring these facilities online.